We awoke to more clear skies and took a quick tour of Lake Basin. We went south and passed more lakes, crossed a stream and a ridge, and dropped due west to Marion Lake. A woman was camped at the lake, and we dropped in for a few minutes to chat. She was a ranger at Ceadr Grove and had traversed Cirque Crest before dropping to the lake from the south, a route that looked and sounded quite challenging! After that we searched a while before finding the memorial plaque several yards west of the outlet stream. Several wildflowers bloomed around the rock with Helen Marion LeConte's plaque on it, adding to its charm. We then took the trail from the outlet stream toward the old JMT but lost it quite rapidly. We went by the easiest way and soon met our earlier route between the lakes, retracing our steps to camp and breakfast. From our camp it took only two hours to reach Dumbbell Pass, which was a beautiful scene. Through its narrow gap to the northeast was framed North Palisade and Mt. 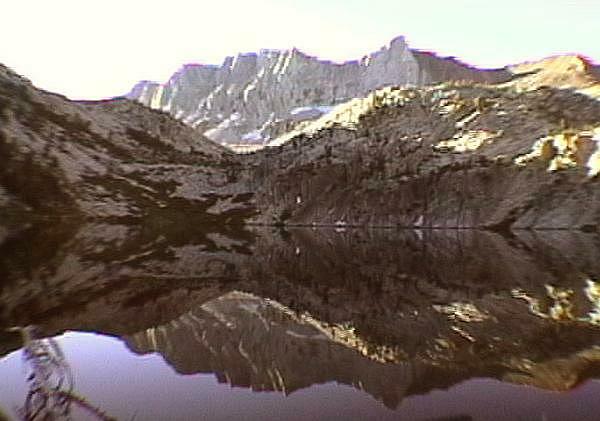 Sill, while Marion Peak was centered in the southwest. We then worked our way cautiously down a snow-slope to the right, stepping off into a field of huge and spooky talus. We could not see over the edge of these massive blocks, so we moved cautiously right until reaching a slope of less precarious angle. The famous Secor book said to go around the first lake on its west side, but it took a lot of work just to reach the lake at its southern end. Despite our next pass showing clearly around the east end, we obediently worked our way west, looking uneasily at another afternoon of mean cloud build-up as the lake continued to turn us left. We then reached a spot that the topo map implied was a cliff into the lake, and so it was. A few minutes of class-three work (hand-holds REQUIRED!) put us back on familiar rough talus, and we finally cleared the lake after a long two hours' work. We then headed north toward lower lakes and trees and found several whitebark-pine screens to hold back the gusty winds. Our camp was near 11000 feet, and we were chilly but undampened, the harsh clouds overshooting us yet again. We saw no evidence that anyone else was in this basin while we were there.